The Chongz ’16 Baby 16′ Double Bubble Lizard Acrylic Waterpipe is one of our top sellers and with good reason. This 40cm tall bong is made from sturdy acrylic and is finished in a transparent brown colour with the famous Chongz logo and lizard motifs. The Chongz ’16 Baby 16′ Double Bubble Lizard Acrylic Waterpipe features a removable bowl and downstem, rubber grommet to keep the stem sturdily in place and a removable bong base for easy cleaning. The double bubble design allows user to fill the waterpipe with ice, providing an even cooler, smoother smoke. Hurry, the Chongz ’16 Baby 16′ Double Bubble Lizard Acrylic Waterpipe won’t stay in stock for long, especially at just £17.99. The Chongz ‘Dickies Hoop’ Acrylic Bong is a great bong at a great price point. This compact bong measures 30cm high and weighs less than 300 grams making it perfect for travelling with. This bongs tough and durable acrylic design means that it can withstand an accidental drop that would be disastrous for a traditional glass design. What’s more, the Chongz ‘Dickies Hoop’ Acrylic Bong is filled with features too! The bubbled base and 4 decorative round windows allows you to see the full glory of the smoke as you use it, and the metal downstem and rubber grommet add to the quality feel overall. The added ice twist also means that you can experience a smoother smoke and extra filtration too. The Chongz ‘Dickies Hoop’ Acrylic Bong is available now for just £16.99, so what are you waiting for? Bongs have been popular smoking aids for centuries, but along with most things, with advances in technology you can now get bongs made from a variety of different materials, but acrylic has a lot to offer, it resembles glass, but has properties that make it superior to glass in many ways. We are seeing an increasing number of bongs which are made from acrylic, because it is lighter, it is increasingly being chosen over glass. 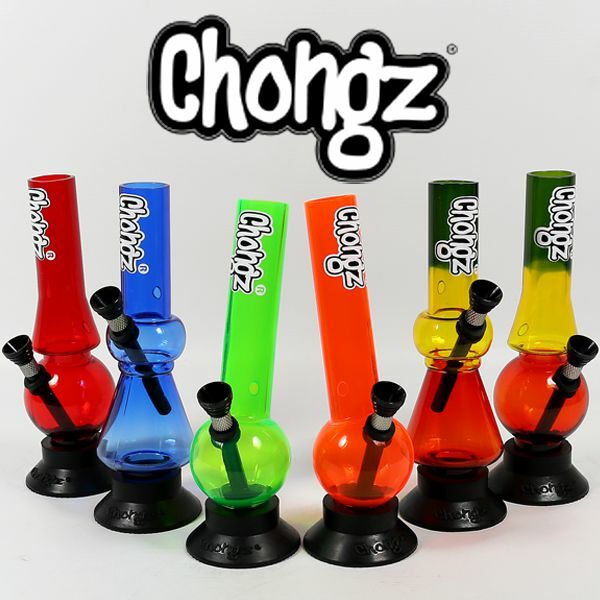 We are happy to introduce a really great little bong from Chongz which is small but very durable, a great way to be able to have a smoke when travelling. Throw it in your back pack, no fear of it breaking and when you feel like it, bring it out whenever the fancy takes you. The Chongz Miniature Bong is easy to keep clean, simply remove the rubber base and stem, we suggest that for maximum enjoyment from your bong, use bong cleaners and bong brushes regularly. This clears up any debris and tar that gets stuck and builds up over time, leaving you a better tasting smoke and easier inhalation. At just £9.99, this colourful acrylic bong is a steal, the colours vary, but whatever the colour, it will not detract from that quality of your tobacco or herb. The Jelly Baby Ice Bubble Bong is perfect for those hot summer days as you can load it up with cold water and ice for a smooth, cool smoke. These budget waterpipes are made from toughened frosted acrylic and feature a sturdy base to prevent spillages. This bongs ice twist feature allows the neck to be filled with ice, not only cooling down the smoke but also removing more impurities from the smoke, giving you the smoothest, cleanest hit possible. The large bubble base also allows you to put more water in the bong, adding to the cool filtering affect. The Jelly Baby Ice Bubble Bong is perfect for those who want an effective bong without wanting to stretch the budget. They are available now for just £19.99 each (please note: colours may vary). Why not check out our full range of acrylic bongs here. We know that water pipes and bongs have been used by smokers just about everywhere, going right back in time used to deliver the pleasure of the tobacco or herbal mixture to the user in a cleaner and cooler way. The 34cm 4 Tiered Hoopla Bong will not disappoint the smoker and what is more it not only feels great to use, but it looks good as well and is sure to compliment any room where it is displayed. Strong and beautifully made in lasting acrylic, we expect that this 4 Tiered Hoopla Bong will be in everyday use in your home for many years. The Hoopla Bong is also technically well designed too, with the bubble design you can add extra water and of course this means that you will get a cooler as well as a cleaner and far more satisfying smoke. At just £14.99 at our web pages, this bong has to represent great value, keeping your bong clean ensures a satisfying smoke, so check out the offers on recommended cleaning materials at the site. Bongs have been popular smoking aids for centuries and with advances in technology you can now get bongs made from many different materials such as glass, acrylic and even ceramic. Today we are looking at the fantastic Mutz Nutz Rocket 400 bong made from toughened acrylic. We guarantee that you will get a high quality smoking experience from the Mutz Nutz Rocket bong and at 40cm tall the bong has a wide Tail Fin which ensures that it has stability and will stand perfectly and not be easily tipped over when in use. It has been described by users are giving a rocketing experience when smoked with your favourite herbal mixture or tobacco product and for user who like to have control a carb hole has been added to the back of the bong. Currently this De-Lux bong is being offered by us at a special price of just £27.19 which is discounted 20% of the recommended price. Grab this bong now and give yourself a rocketing experience. Here at Shiva Online we bring you the best in smoking paraphernalia, and our newest range of Killer Bongs is no exception. Choose from a range of 12 different bongs, all with their own designs from a simple bubble bong to the more complex twisted ice bong. There is definitely something for everyone in the range from the outrageously large Straight Shooter 120, a 120cm tall bong that produces the coolest smoke, to the simple yet efficient Mr Black bubble bong. Made from a combination of a hardened acrylic and glass stems, these bongs are made to last and won’t hurt your wallet too! The acrylic bongs are finished in black with red accents or see-through with silver accents, all of which make a great addition to your bong collection. With prices starting from just £24.99, Killer Bongs give you a big bang for your buck! These stylish D-Lux bongs not only look great, but produce a cool and smooth smoke every time. Made from strong and durable acrylic, the D-Lux Triple X 40cm Bong is specially designed for regular use and features a sturdy metal base and drop-in cone for easy use. Available in ultra-violet or black finishes, this bongs bubble water chamber and ice twist produce a cool and smooth smoke by filtering out most of the harmful carcinogens and cooling the smoke as it travels through the bong. So if you want to smooth and efficient smoke, the D-Lux Triple X 40cm Bong is a great choice and at just £37.99, it’s a great price too! Mini Acrylic Waterpipes – funky and fun! In thease hard times, people are looking for a cheap product that delivers the same experience as an expensive item, and these Mini Acrylic Waterpipes fit the bill nicely. Whether you want to experience a bong for the first time or want to add to your bong collection, Mini Acrylic Waterpipes are strong, colourful and above all efficient to use. Available in four different shapes, these 20cm, tall acrylic bongs look great in any setting and are compact enough to be taken with you wherever you go. Each of these bongs have a built-in bubble compartment, which allows more water to be put in and helps to cool down the smoke for a smooth hit every time. These acrylic bongs are easy to clean and are a lot more durable than standard glass bongs which tend to crack after regular use. Mini Acrylic Waterpipes are available now from just £8.99 each; please note that colours may vary from the picture below. Available in red, purple and blue, the Waterfall Pulsar Bong is an inexpensive water pipe that packs a big punch. Designed for regular use, this bong has a spherical water chamber allowing for more water and thus a cooler, smoother hit. The bong bowl unscrews from the body making it super easy to empty and clean, and the sturdy base helps to prevent accidents. It is recommended that you use screens with this bong to stop debris getting into your mouth. The Waterfall Pulsar Bong is a great accessory for those who want to experience a bong for the first time or for those who want to add a compact and cheap bong to their collection.